Danielle here, popping in quickly to share a fun card! I am absolutely in love with enamel dots at the moment (like so many others!). Honestly, I like to buy them because the colors are just so darn pretty! I have a whole bunch hoarded and decided it was finally time for them to actually make it on a project. Ah, once again Across the Card comes to the rescue! Need to make a quick card? Well this set is perfect for that! All I did was stamp the sentiment, add some dots, and boom! Hope your week is off to a great start! this card is a total stunner!!! 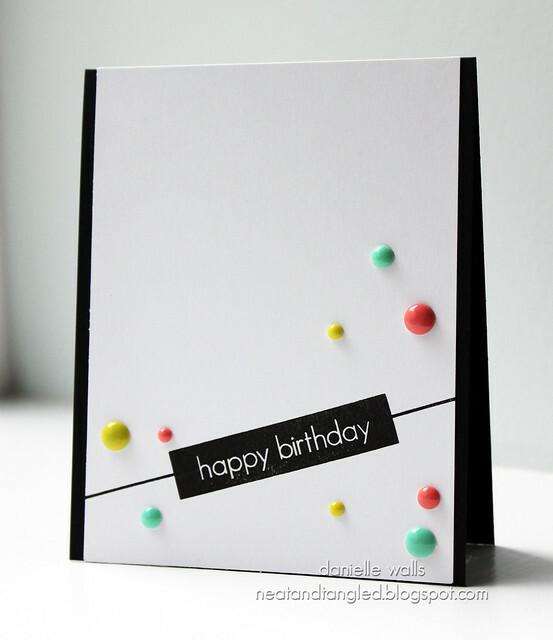 the simplicity and POP of the enamel dots are perfection and an instantly draw you into the card!! wow!! it really lets the sentiment/stamp shine and be the focus! the crispness of the card is just amazing!! wow!! Love it! And I so want some enamel dots! love everything about this. amazing! LOVE this card, Danielle! You're right, too...it can be created quickly and I think it has a lot of impact! Great CAS design and fun pops of color! Perfect example of CAS done right! Awesome design Danielle! Oh, my! I am so glad I just purchased this awesome stamp set. Great card. I am so glad I received that stamp set in the mail today - definitely going to work on some cards this weekend. Oh Danielle I just love this! Enamel dots are one of my favs too, they are great for a fast embellishment go to! Love this across the card stamp set too, been using mine since I got it!! This card is ridiculously brilliant! LOVE LOVE LOVE! 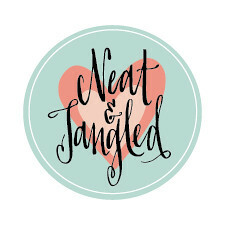 Neat and Tangled is a small company based on the East Coast in Delaware. Our focus is on producing the best quality photopolymer clear stamps, steel craft dies, stencils and sequins. 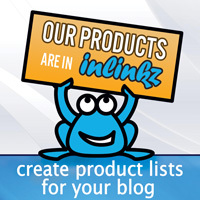 Not only are they the best quality, but they are also produced right here in the USA! Whether bold and graphic, or cute and whimsical, our products can be used together to create endless possibilities! A Blog Named Hero + Neat and Tangled! Noticed By Neat and Tangled! All content, including text and photos © Danielle Walls; All rights reserved. My artwork on here is for personal inspiration and enjoyment only and may not be copied for submission to contests, publications, or design team submissions. Enjoy! Thanks so much for your support! © 2015 Neat and Tangled. Felicity Template designed by Georgia Lou Studios All rights reserved.